1 A None No Power Seat 1 A is an Economy Class Bulkhead seat whose close proximity to the galley may be bothersome. There is no floor storage for this seat during take-off or landing. 1 B None No Power Seat 1 B is an Economy Class Bulkhead seat whose close proximity to the galley may be bothersome. There is no floor storage for this seat during take-off or landing. 1 C None No Power Seat 1 C is an Economy Class Bulkhead seat whose close proximity to the galley may be bothersome. There is no floor storage for this seat during take-off or landing. 15 A None No Power Seat 15 A is an Economy Class seat that may not recline due to the Exit Row behind. 15 B None No Power Seat 15 B is an Economy Class seat that may not recline due to the Exit Row behind. 15 C None No Power Seat 15 C is an Economy Class seat that may not recline due to the Exit Row behind. 15 D None No Power Seat 15 D is an Economy Class seat that may not recline due to the Exit Row behind. 15 E None No Power Seat 15 E is an Economy Class seat that may not recline due to the Exit Row behind. 15 F None No Power Seat 15 F is an Economy Class seat that may not recline due to the Exit Row behind. 16 A None No Power Seat 16 A is an Economy Class Exit Row seat with extra legroom. However, this seat may not recline due to the Exit Row behind. The tray table is in the armrest, making the armrest immovable and slightly reducing seat width. There is no floor storage for this seat during take-off or landing. 16 B None No Power Seat 16 B is an Economy Class Exit Row seat with extra legroom. However, this seat may not recline due to the Exit Row behind. The tray table is in the armrest, making the armrest immovable and slightly reducing seat width. There is no floor storage for this seat during take-off or landing. 16 C None No Power Seat 16 C is an Economy Class Exit Row seat with extra legroom. However, this seat may not recline due to the Exit Row behind. The tray table is in the armrest, making the armrest immovable and slightly reducing seat width. There is no floor storage for this seat during take-off or landing. 16 D None No Power Seat 16 D is an Economy Class Exit Row seat with extra legroom. However, this seat may not recline due to the Exit Row behind. The tray table is in the armrest, making the armrest immovable and slightly reducing seat width. There is no floor storage for this seat during take-off or landing. 16 E None No Power Seat 16 E is an Economy Class Exit Row seat with extra legroom. However, this seat may not recline due to the Exit Row behind. The tray table is in the armrest, making the armrest immovable and slightly reducing seat width. There is no floor storage for this seat during take-off or landing. 16 F None No Power Seat 16 F is an Economy Class Exit Row seat with extra legroom. However, this seat may not recline due to the Exit Row behind. The tray table is in the armrest, making the armrest immovable and slightly reducing seat width. There is no floor storage for this seat during take-off or landing. 17 A None No Power Seat 17 A is an Economy Class Exit Row seat with extra legroom. The tray table is in the armrest, making the armrest immovable and slightly reducing seat width. There is no floor storage for this seat during take-off or landing. 17 B None No Power Seat 17 B is an Economy Class Exit Row seat with extra legroom. The tray table is in the armrest, making the armrest immovable and slightly reducing seat width. There is no floor storage for this seat during take-off or landing. 17 C None No Power Seat 17 C is an Economy Class Exit Row seat with extra legroom. The tray table is in the armrest, making the armrest immovable and slightly reducing seat width. There is no floor storage for this seat during take-off or landing. 17 D None No Power Seat 17 D is an Economy Class Exit Row seat with extra legroom. The tray table is in the armrest, making the armrest immovable and slightly reducing seat width. There is no floor storage for this seat during take-off or landing. 17 E None No Power Seat 17 E is an Economy Class Exit Row seat with extra legroom. The tray table is in the armrest, making the armrest immovable and slightly reducing seat width. There is no floor storage for this seat during take-off or landing. 17 F None No Power Seat 17 F is an Economy Class Exit Row seat with extra legroom. The tray table is in the armrest, making the armrest immovable and slightly reducing seat width. There is no floor storage for this seat during take-off or landing. 2 D None No Power Seat 2 D is an Economy Class Bulkhead seat that has extra legroom however, the close proximity to the galley may be bothersome. There is no floor storage for this seat during take-off or landing. 2 E None No Power Seat 2 E is an Economy Class Bulkhead seat that has extra legroom however, the close proximity to the galley may be bothersome. There is no floor storage for this seat during take-off or landing. 2 F None No Power Seat 2 F is an Economy Class Bulkhead seat that has extra legroom however, the close proximity to the galley may be bothersome. There is no floor storage for this seat during take-off or landing. 33 A None No Power Seat 33 A is an Economy Class seat in the last row of the plane that may not recline. The close proximity to the lavatories and galley may be bothersome. 33 B None No Power Seat 33 B is an Economy Class seat in the last row of the plane that may not recline. The close proximity to the lavatories and galley may be bothersome. 33 C None No Power Seat 33 C is an Economy Class seat in the last row of the plane that may not recline. The close proximity to the lavatories and galley may be bothersome. 33 D None No Power Seat 33 D is an Economy Class seat in the last row of the plane that may not recline. The close proximity to the lavatories and galley may be bothersome. 33 E None No Power Seat 33 E is an Economy Class seat in the last row of the plane that may not recline. The close proximity to the lavatories and galley may be bothersome. 33 F None No Power Seat 33 F is an Economy Class seat in the last row of the plane that may not recline. The close proximity to the lavatories and galley may be bothersome. 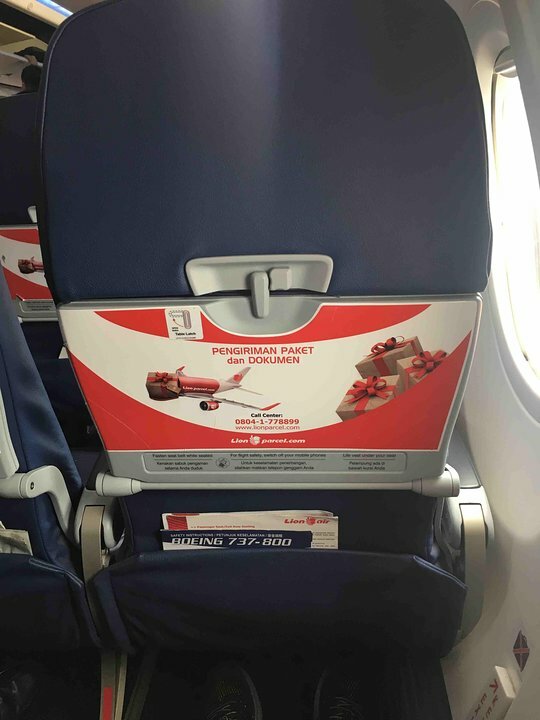 Lion Air flies their Boeing 737-800 with 189 seats in a one-class configuration of Economy. The legroom is severely reduced in this seat. Only about 7 inches between the edge of my seat and the back of the seat in front of me. Lion Airlines flies 1 versions of Boeing 737-800 (738).